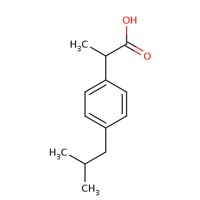 INTRODUCTION: The 2- arylproprionic acid derivative, Ibuprofen [RS- 2- (4-isobutyl- phenyl) propionic acid], is one of the most potent orally active antipyretic, analgesic and non- steroidal anti-inflammatory drug (NSAID) used extensively in the treatment of acute and chronic pain, osteoarthritis, rheumatoid arthritis and related conditions. This compound is characterized by a better tolerability compared with other NSAIDs. It is of particular interest that the gastroenteric side effects, common to most anti-inflammatory agents, are drastically reduced 1. 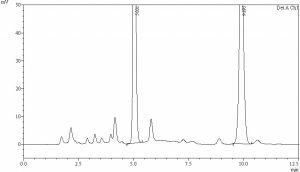 Several methods have been published for the determination of Ibuprofen in biological fluids using gas chromatography (GC) 2-4 and high-performance liquid chromatography (HPLC) 5,6,7 They are not suitable for routine quantification of Ibuprofen. These methods require large sample volumes and are time consuming and tedious because liquid-liquid extraction, and derivatization are required for sample clean-up. One method available with minimal sample volume in solid phase extraction but this is more expensive method 8. All published HPLC methods used reversed phase stationary phases. Because of the very polar nature of Ibuprofen, a reasonable retention was only achieved with very low fractions of organic modifiers in the mobile phase. A sensitive analytical method is necessary for quantification of the concentrations of Ibuprofen in human plasma in order to support pharmacokinetic and bioequivalence studies. We here present a method for the routine quantification of the novel antiepileptic drug Ibuprofen in human plasma by HPLC- UV. The procedure is very easy, quick, inexpensive and rugged. 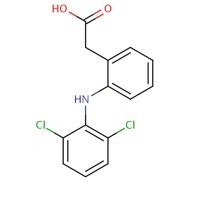 Chemicals: Ibuprofen reference standards and Diclofenac sodium (internal standard) was obtained from the Varda biotech (P). Ltd., Mumbai, India,. Chemical structures are presented in Fig. 1. Drug free plasma containing K3EDTA as an anticoagulant was collected from Micro Therapeutic Research Labs Pvt Ltd. Chenanai. Acetonitrile (HPLC Grade), methanol (HPLC Grade), Di-Potassium hydrogen phosphate anhydrous (GR Grade) from Merck (India), Milli-Q system (Millipore, Bedford, MA, USA) was used. Chromatography: The integrated high performance liquid chromatography system (LC 2010C, Shimadzu Corporation, Kyoto, Japan) was equipped with a Binary pump, a degasser, an auto sampler, an injector with a 100 µL loop, a column oven, a UV detector and a data system (LC solution software version 1.21 SP2). The separation of compounds was made on a C-18 hypersilgold column (150 X 4.6 mm, 5 µ) 40 °C temperature. The mobile phase was a mixture of buffer (50 mM Di-Potassium hydrogen phosphate anhydrous, pH 6.5): Methanol (80:20 v/v) pumped at a flow-rate of 1.0 mL/min. Detection was set at a wavelength of 220 nm. Peak quantification was done by peak area ratio method. 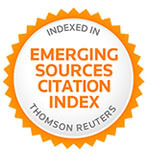 All regressions and figures presented in this study were generated by Shimadzu LC solution version 1.21 software. Sample processing: A 100 μL volume of plasma was transferred to a 4mL ria vial, and then 50 μL of IS working solution (30μg/mL) was spiked. After vortexing for 30 s, add 250 μL of methanol to precipitate the plasma. The sample was vortex-mixed for 10 min using a Multi-Pulse Vortexer (Heidolph, Germany). The sample was then Centrifuge at rcf 1891 + 100 for 10 minutes at 10°C using Multifuge 3S-R (Kendro Lab, heraeus, Germany).Transfer the supernatant into prelabled HPLC vial for analysis and a 35-μL aliquot was injected into the chromatographic system. Calibration and control samples: Standard stock solution of Ibuprofen (1 mg/mL) and Diclofenac sodium ISTD (1 mg/mL) was separately prepared in methanol. Spiking solutions for calibrations curve and quality controls were prepared by appropriate dilution in methanol: water (50:50, v/v).The IS working solution (30 µg/mL) was prepared by diluting its stock solution with methanol: water (50:50). Spiking solutions (0.2 mL) were added to drug-free human plasma (9.8 mL) as a bulk, to obtain Ibuprofen spiking concentration levels of 1-100 µg/mL. The quality control pools were divided into aliquots in micro centrifuge tubes (Tarson, 2 mL) and stored in the freezer at −70 ◦C until analysis. Each validation run consisted of a double control, system suitability sample, blank samples (a plasma sample processed without an IS), a zero sample (a plasma processed with IS), calibration curve consisting of eight non-zero samples covering the total range (1µg/mL to 100µg/mL) and QC samples at three concentrations (n = 6, at each concentration). Such validation runs were generated on six consecutive days. Calibration samples were analyzed from low to high at the beginning of each validation run and other samples were distributed randomly through the run. Linearity was assessed by a weighted (1/x2) least squares regression analysis. The calibration curve had to have a correlation coefficient (r2) of 0.99 or better. The acceptance criterion for each back-calculated standard concentration was 15% deviation from the nominal value except .LLOQ, which was set at 20%. At least 67% of non-zero standards should meet the above criteria, including acceptable LLOQ and upper limit of quantification. Specificity: Randomly selected seven blank human plasma samples included hemolysed sample, which were collected under controlled conditions, were carried through the extraction procedure and chromatographed to determine the extent to which endogenous plasma components may contribute to interference with the analyte or the internal standard. The results were compared with LLOQ (1 µg/mL). 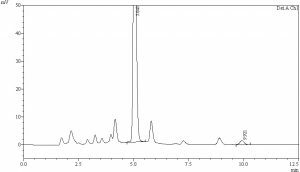 Recovery: Recovery of Ibuprofen was evaluated by comparing the mean peak areas of six extracted low, medium and high quality control samples to mean peak areas of six unprocessed reference solutions. Recovery of IS was evaluated by comparing the mean peak areas of low, medium and high quality extracted quality control samples to mean peak areas of 18 unprocessed reference solutions of the same concentration. Accuracy and precision: Within batch accuracy and precision evaluations were performed by repeated analysis of Ibuprofen in human plasma. The run consisted of a calibration curve plus six replicates of each LLOQ, low, medium and high quality control samples. Between-batch accuracy and precision were assessed by analysis of samples consisting of a calibration curve and six replicates of LLOQ, low, medium and high quality control samples for Ibuprofen on three separate occasions. During routine analysis, each analytical run included a set of calibration samples, a set of QC samples in duplicate and plasma samples to be determined. The overall precision of the method expressed as relative standard deviation and accuracy of the method. Stability: Twenty four hour stability was examined by keeping replicates of the low and high plasma quality control samples at room temperature for approximately 24 h. Freeze- thaw stability of the samples was obtained over three freeze-thaw cycles, by thawing at room temperature for 2- 3 h and refrozen for 12- 24 h for each cycle. Autosampler stability of Ibuprofen was tested by analysis of processed and reconstituted low and high plasma QC samples, which are stored in the autosampler tray for 110 h.
Stability of Ibuprofen in human plasma was tested after storage at approximately −70 ◦C for 60 days. For each concentration and each storage condition, six replicates were analyzed in one analytical batch. The concentration of Ibuprofen after each storage period was related to the initial concentration as determined for the samples that were freshly prepared and processed immediately. Separation: Fig. 2 shows the representative chromatograms of blank plasma, plasma samples spiked with Ibuprofen at 84 µg/mL and at LLOQ (1 µg/mL), The analytes were well separated from co- extracted material under the described chromatographic conditions at retention times of 5.0 and 9.9 min, respectively. The peaks were of good shape, completely resolved one from another at therapeutic concentrations of Ibuprofen. No interference with constituents from the plasma matrix was observed. Fig 2: Chromatograms of (A) blank human plasma; (B) human plasma sample spiked with 84 µg/mL of Ibuprofen and IS (HQC); (C) spiked human plasma sample at LLOQ (1µg/mL). Approximate retention times: Ibuprofen = 9.9 min; IS = 5.0 min. Linearity and sensitivity of the assay: The peak area ratio of Ibuprofen to IS in human plasma was linear with respect to the analyte concentration over the range 1 to 100 µg/mL. The calibration model was selected based on the analysis of the data by linear regression with/without intercepts and weighting factors (1/x, 1/x2 and 1/√x). The residuals improved by weighted (1/x2) least-squares linear regression. The best fit for the calibration curve could be achieved with the linear equation y = mx + c with a 1/x2 weighing factor. The correlation coefficient (r) for Ibuprofen was above 0.999 over the concentration range used. Table 1 summarizes the calibration curve results for the analyte. These calibration curves were suitable for generation of acceptable data for the concentrations of the analyte in the samples during between- and within-batch validations. The lower limit of quantification (LLOQ), the lowest concentration in the standard curve, which can be measured with acceptable accuracy and precision for the analyte from normal human plasma, was established as 1 µg/mL. The mean response for the analyte peak at the assay sensitivity limit (1µg/mL) was ≈ 8.12-fold greater than the mean response for the peak in six blank human plasma samples at the retention time of the analyte. Extraction: The optimized protein precipitation extraction with Methanol eliminated the laborious extraction steps of evaporation and reconstitution involved in generic solid phase and liquid–liquid extraction methods without compromising the sensitivity, which further resulted in reduced processing and analysis time. The extraction recovery of Ibuprofen at low, medium and high quality control samples was 78.4±3.1%, 77.6=1±2.3% and 77.7±1.8%, respectively. It indicates that extraction recovery of Ibuprofen is independent of concentration. The recovery of IS was 75.9% at the concentration used in the assay (30µg/mL). Specificity: There were no interfering peaks present in six different randomly selected samples of drug free human plasma used for analysis at the retention times of either analyte or IS There was no interference of Ibuprofen and IS analysis by other potentially co-administered drugs such as paracetamol, ibuprofen, aspirin, ampicillin, amoxicillin. Accuracy of the assay: The accuracy values for between and within-batch studies at the LLOQ and at low, medium and high concentrations of Ibuprofen in plasma were within acceptable limits (n=6). A- Within-batch variability of the assay: The results shown in Table 2 indicate that the assay method is reproducible for replicate analysis of Ibuprofen in human plasma within the same day. B- Between-batch variability of the assay: The results shown in Table 2 indicate that the assay method is reproducible on different days. Stability: Stock solutions of Ibuprofen (1 mg/mL) and IS (1 mg/mL) were prepared separately in methanol. The weight of analyte was corrected for purity. The solutions were stable for at least 28 days when stored at 4 ◦C. The stability experiments were aimed at testing all possible conditions that the samples might experience after collecting and prior the analysis. These were performed as described previously. All stability results are summarized in Table 3. Three freeze- thaw cycles and 24 h room temperature storage for low and high quality controls samples indicated that Ibuprofen was stable in human plasma under these conditions. QC samples were stable for at least 75 days if stored frozen at approximately −70 ◦C. Testing of autosampler stability of quality control samples (Table 3) indicated that Ibuprofen is stable when kept in the autosampler for up to 112 h.
Dilution integrity: The dilution integrity was also conducted to assess whether the upper concentration limit (100 µg/mL) can be extended. Quality control samples (in six replicates) at a concentration 168 µg/mL were diluted by four times with blank plasma, and the assay precision and accuracy were determined in a similar manner as described previously. For Ibuprofen, the concentration found was 169.7686 + 1.5 % µg/mL and accuracy was 101.1 %. The results suggested that samples whose concentrations were greater than the upper limit of the standard curve could be re-analyzed by appropriate dilution. CONCLUSION: The developed HPLC/UV method employing Protein precipitation for sample preparation is very simple and convenient for the quantification of Ibuprofen in human plasma samples. The previously reported methods for the analysis of Ibuprofen in biological fluids  were not too satisfactory because all of them were too expensive. The validation data also demonstrate good precision, accuracy and high extraction efficiency. The validated method allows quantification of Ibuprofen in the 1.0-100 µg/mL. 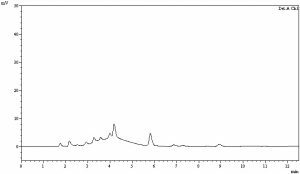 In conclusion this paper describes a very simple and sensitive HPLC method for the quantification of Ibuprofen suitable to monitor plasma concentrations during clinical pharmacokinetic studies in humans. ACKNOWLEDGEMENT: The authors wish to acknowledge the support received from the entire method development team, Micro Therapeutic Research Labs Pvt. Ltd., Chennai. Aarons, L., Grennan, D. M. and Siddiqui, M: 1983. European Journal of Clinical Pharmacology 25:815. Bressolle, F., Bromet-Petit, M. and Audran M: 1996. Journal of Chromatography B 686:3. Evans, A. M. 1992. European Journal of Clinical Pharmacology 42:237. Shah, V. P., Midha, K. K. and Dighe, S. 1992. 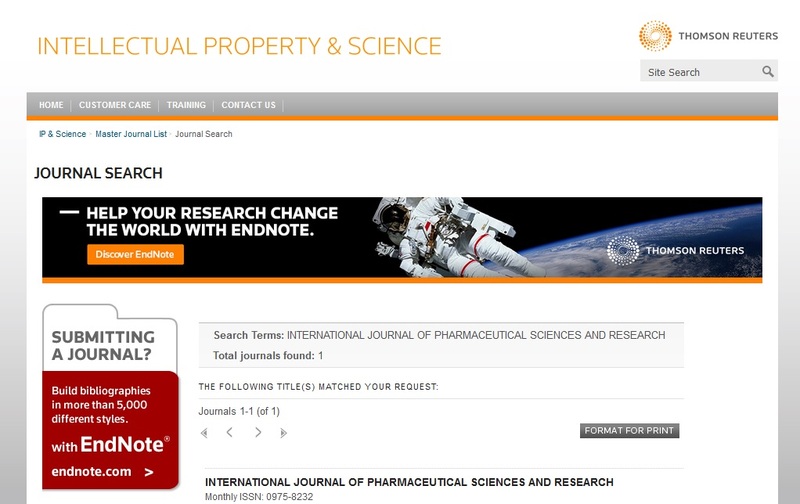 Journal of Pharmaceutical Sciences 81:309. Canaparo R, Muntoni E, Zara GP, Della Pepa C, Berno E, Costa M, Eandi M. Biomed Chromatogr. 2000 Jun; 14(4):219-26.